- this website has useful leaflets which can be freely down-loaded. I'm an occasional waller, specialising in straight-ish sections. This was my first tiny project in the mid 1970's. 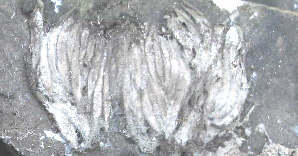 The object was to fill in between pillars on a mortared wall base. Mosses and succulent plants have since formed a dense matt on top of the wall, inhibiting growth of woody plants which could cause damage. 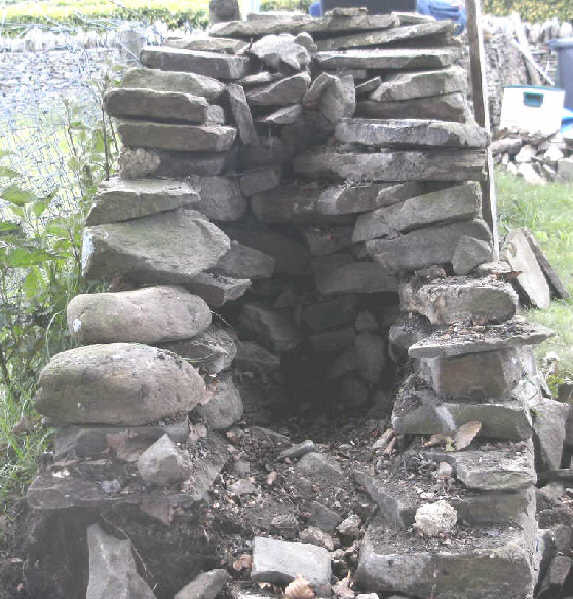 After many years of working in an office, I was pleased to get training from a Dry Stone Walling Association instructor, and later repaired this section of wall in a local allotment (awaiting coping stones). Considering the shape of the land and stones, straight and level courses were not easy to achieve - but wouldn't that be boring? 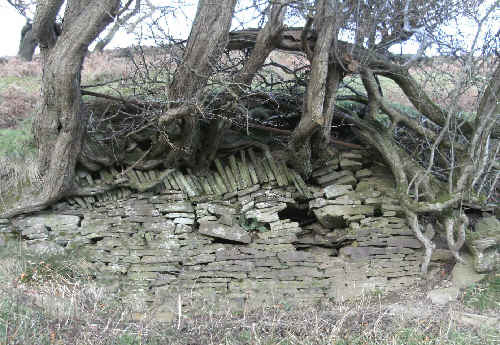 A boundary wall repair - move mouse over image to see the original state. 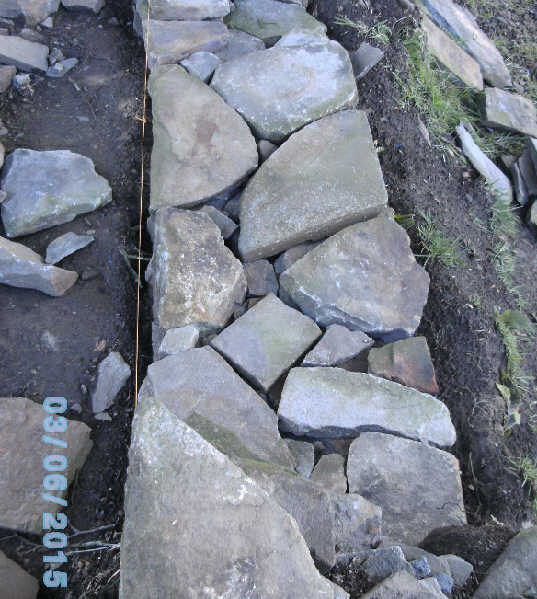 Suitable coping stones were not available, so I placed the few large, flat stones I had as uprights, and infilled with "random" left-over stones. I left some small voids near the bottom of the wall for wildlife, and a field vole was seen visiting during tea breaks. 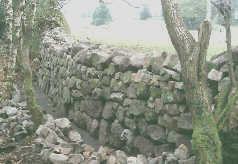 Another similar boundary wall repair - about 1.6m (5 feet 6 ins high). The stones available were mostly on the small side, so this took a while. If you are a wall builder, or a customer for a new or repaired wall, having a guide to good practice is a good idea. 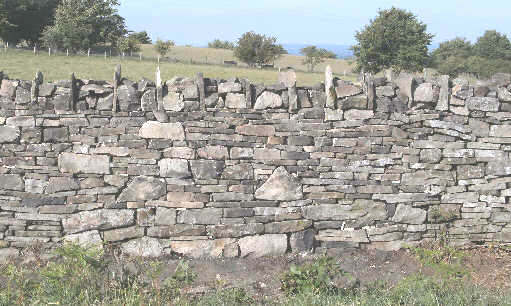 I found that the DSWA leaflet "A Brief Guide To Inspecting Dry Stone Walling Work" contains a concise list of things to look for in a well built wall, and I expect there are other guides. However, it could be impractical to try to adhere to a rigid set of rules - it's also good to observe what constructions have stood the test of time (or not). 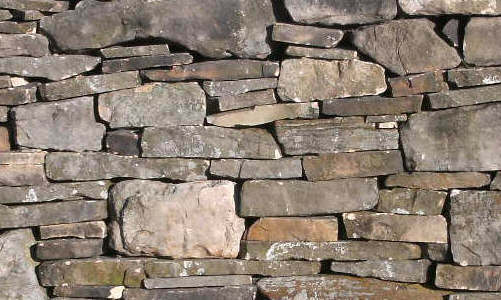 For repairing walls, a lack of suitable material is a common problem - that is the optimum shape and number of the various types of stones required in the construction of a wall (as opposed to a heap of stones!). Then it's a matter of doing the best under the circumstances, or it may be necessary to obtain more material if that is practical and economical. 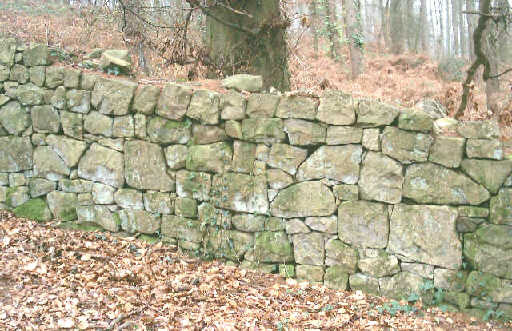 Building a dry stone wall with insufficient tying or through stones across the width of the wall is likely to cause weakness. 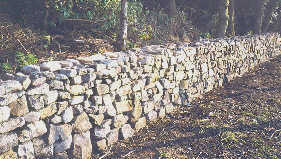 It's tempting to use the "long" faces of stones along the wall - it's quicker to build. Below left is an example of this, the wall is bulging out and is likely to fall (I've removed some randomly placed hearting stones). Below right, the section is being rebuilt. Although few through stones were available, trying to place stones which span 50% or more of the width should help tie it all together. 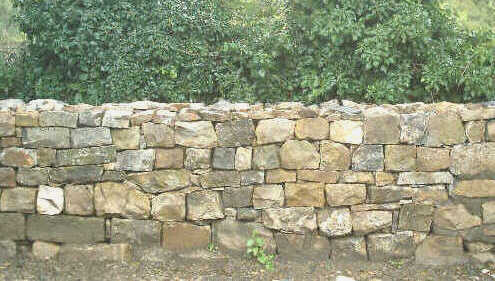 Several training courses were funded via a Communities First scheme, during which teams repaired sections of dry stone walls in the American Gardens (left, 2006/7/8) and Lasgarn Wood (right, 2008), in Torfaen, south Wales. 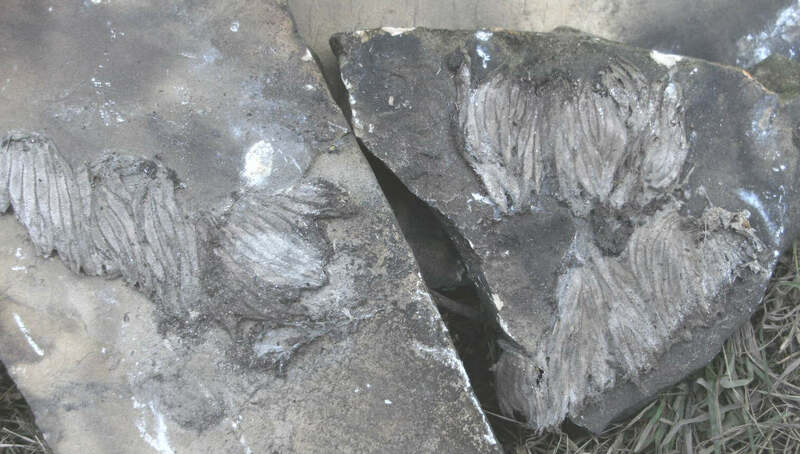 I found a large number of old (possibly moth) cocoons in a 4 metre section of partly collapsed wall, probably 500 plus. If you have seen similar, or can provide any more information I'd be interested to hear. 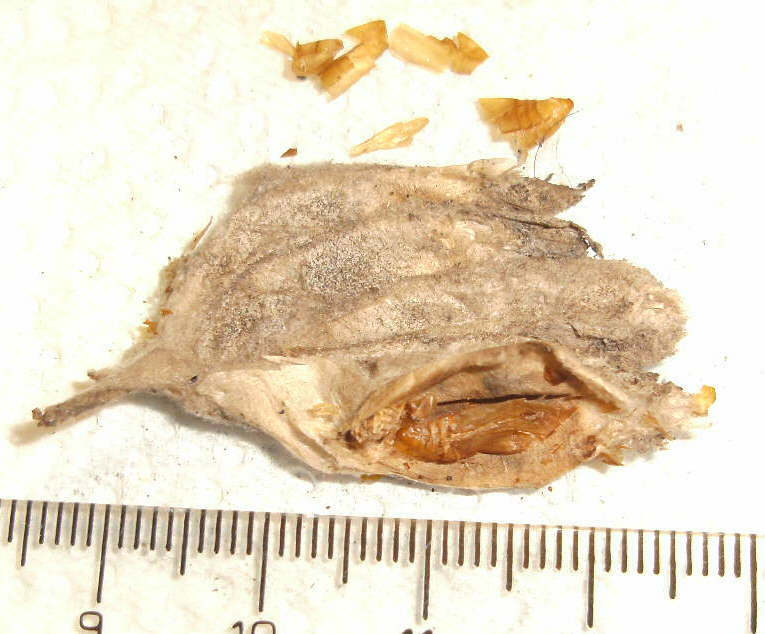 See larger photo, and what's inside one (possibly a pupa shell?). Not conforming to the "big stones at the bottom" theory, this section has outlasted other more conventional sections. I think this is because the waller took time to ensure that the stones fit well together. 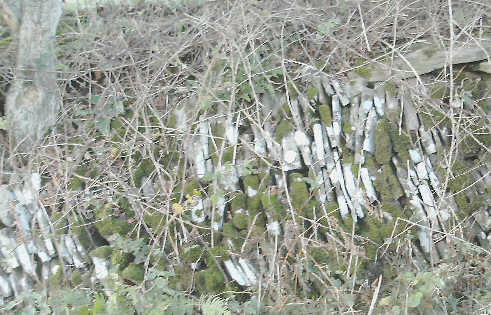 A retaining wall with vertically placed stones spotted in the Black Mountains - a good style if you feel like lying down while working?